Omphaloskepsis of the day: what have I been listening to? I realized a few minutes ago that I had left iTunes turned on most of the day, even though I wasn’t around, playing through four “Rhino Hi-Five” greatest hits EPs, including three I had just purchased today: Gordon Lightfoot, Christopher Cross, Seals and Crofts, and the one I already owned, The Cars. (One of these things is not like the others.) Yes, that’s a triple dose of yacht rock. And I missed it. Anyway, that realization led to another: that all of these excess plays that I hadn’t actually been listening to have ticked up both the songs’ play count in iTunes and their “scrobbled” totals on my Last.fm profile. Oops. But contemplating that, I became interested in checking out a little bit more of the data Last.fm has been compiling about my listening habits. In the beginning I only signed up with Last.fm to handle automatic scrobbling, so my playlist could show up in real-time on this site. Cool, but the details you can dig up on the Last.fm site itself go way beyond that. The statistic I found the most interesting was the total number of plays of a given artist over various periods of time. And so, with that thrilling introduction, here are screenshots of my personal listening charts for the past 12 months, the past 3 months, and the past week. What did I say about navel gazing? I’ve listened to my own music more than I’ve listened to artists #2 through #8 put together. Granted, that’s in large part because when I’m working on new music I tend to listen to the rough mixes over and over and over again, making adjustments, making new mixdowns, lather, rinse, repeat. But still… I listen to myself a lot. 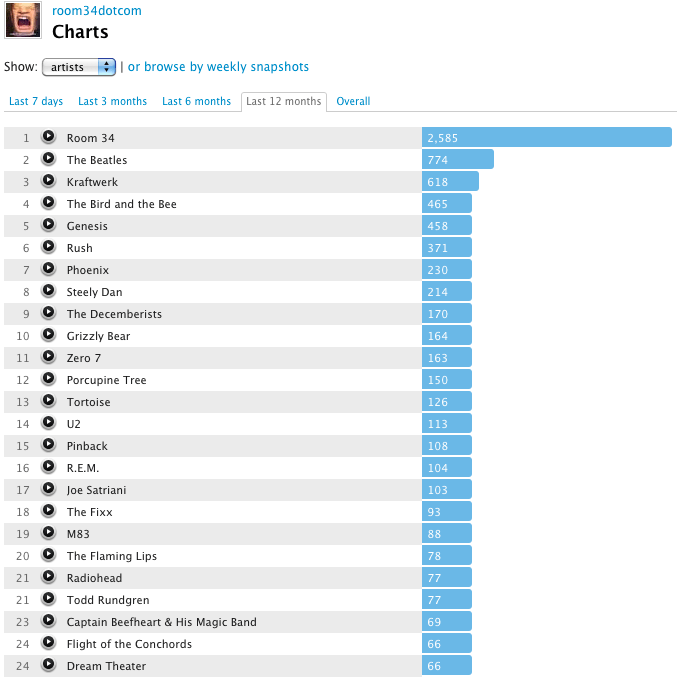 The rest of the list… yeah… those are the bands I thought I’d listened to the most, although I’m a bit surprised Genesis is so high up there. And The Beatles take the lead! Not entirely surprising, given the intense interest generated by the new boxed set. 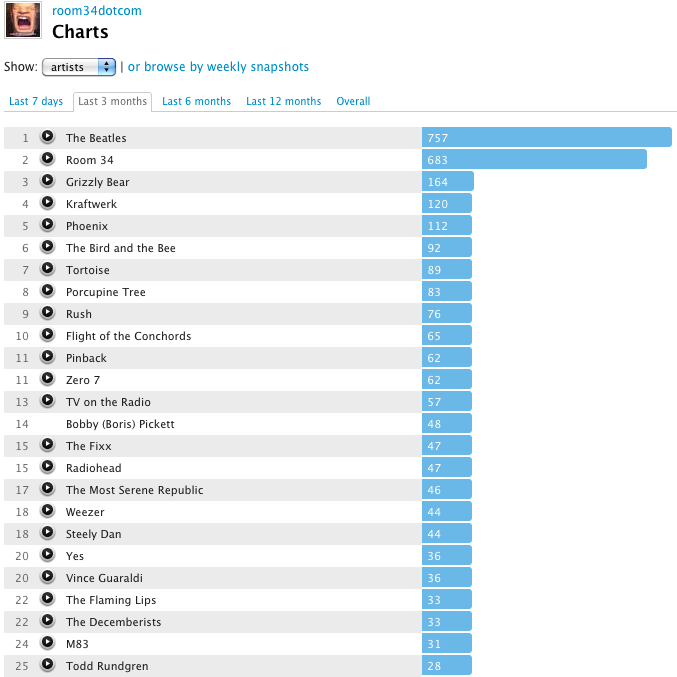 I’ve listened to Beatles tracks 757 times in the past 3 months, but had only listened to them 17 times in the 9 months prior. The boxed set came out two months ago. Then, of course, there’s good ol’ #14: Bobby (Boris) Pickett. The one-hit wonder who produced “Monster Mash” and an album full of other songs that all sound exactly like “Monster Mash.” I picked up that album for Halloween. I’m pretty sure all 48 of those scrobbles are from a 48-hour time period. No, I didn’t listen to a song an hour. And the last one worth noting: #20: Vince Guaraldi. The only album I have by him is A Charlie Brown Christmas. Is it too early? 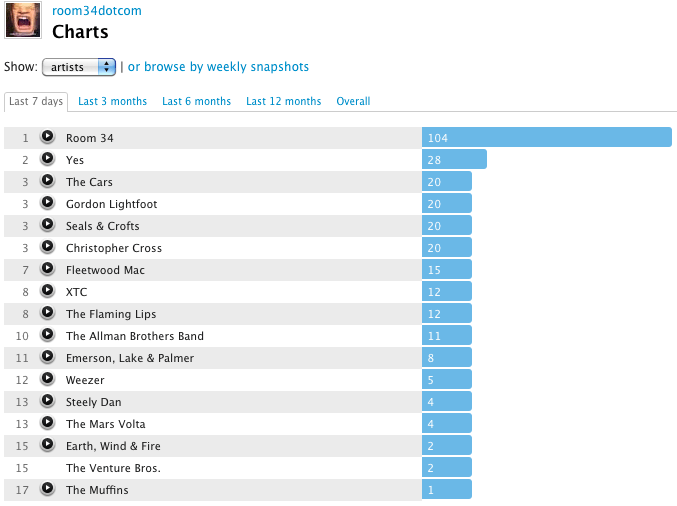 It’s a shorter list, because apparently I’ve only listened to 17 different artists in the past week. And now, a realization, or more accurately, a recollection: Last.fm scrobbles TV shows watched in iTunes or on the iPod/iPhone just like it scrobbles music. Hence The Venture Bros. tied for 15th place. I’ve been on a Yes kick this week. I have not, however, been on a The Cars, Gordon Lightfoot, Seals & Crofts, or Christopher Cross kick. I did purchase those EPs today, but I haven’t even listened to each of them once. The scrobbles lie! iTunes was running all afternoon and early evening, but my speakers were turned off, and for much of that time I wasn’t even in the house. Yes, there is a point! Internet log data does not equal the truth. Just because Last.fm says I listened to this music, that doesn’t mean I listened to this music. What it really says is that my computer was turned on, iTunes was running, and it was processing these MP3s. Sending the music to speakers that weren’t turned on, for the benefit of ears that weren’t even in the room. And if logs can be wrong about this, what else might they be wrong about?